1. What are the origins of your project? When did it start? What were the main goals? In 2003 I was thinking about starting a blog, and went to a workshop called Designing for Civil Society, at a conference. I suggested we blog the workshop... And afterwards I kept it going. 2. What needs does it address, what sort of problems does it try to solve? I have worked as a print journalist, and as a consultant in regeneration, community engagement, and partnership organisations. The focus of the blog -and my current work- is on how to mix face-to-face and online communication for collaborations. I continue to work as a consultant, helping people develop processes for collaboration. 3. Often, day to day practice and community use can shift or reshape the goals and needs. How has this everyday praxis changed the project since its kickoff? Yes. I work as a freelance, sometimes on my own and sometimes in teams with others. Our work is shaped by the jobs that we get. I try and write about the work that I do, without compromising clients. Since most of the work is for public bodies or nonprofits, I believe in sharing lessons learned. 4. In our experience with the Bank of Common Knowledge, collective games make for perfect setups to spread certain ideas or raise awareness about the user/player's own reality. Can you talk about your intentions with that particular strategy and your own perception of that format as a medium? The games were originally developed from work done by Drew Mackie, who I have worked with for 25 years. Drew and I found that games workshops were the best ways to help people develop ideas collaboratively. The framework of the game created a common place, and language, for people to get to know each other and explore opportunities. 5. You have been working on these "new" communication tools for decades. What have you learnt from this experience? • It is helpful to think about four main functions: getting and consuming information; communicating and communing with others; creating content; collaborating. • People have different preferences for online, offline, phone, text, etc. • No one method does it all - mix media. • Some people are collaborative -others are not. Attitude is more important than skill. 6. From all the different "useful games" you have tested, is there a type or model that works better than others? • People work in groups of about six people. • They describe the situation they are addressing to get a shared understanding of who is involved, the history, the challenges, the opportunities. This can be a real situation, or fictional (if the game is run as a demonstration in a conference for example). 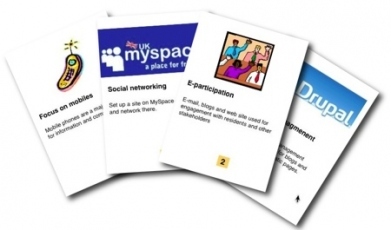 • Groups are then given a set of cards with ideas for action, or tools. These may be physical projects or, for example, communication methods. The cards used are prepared in advance to meet the likely situation broadly defined. • Each card has an image (so they don't all look alike), a brief activity/tool description, and a budget of 1, 2, or 3 points reflecting resource cost or difficulty. • Groups choose a sub-set of cards appropriate to the challenges they face, within a budget of, say 15 points. They then organise these as an action plan. • If there is time, groups then take one or more of the characters in the situation and tell the story of how their lives will be affected by the projects/activities proposed over a period of months or years. People often come from different sectors and disciplines, and don't necessarily have a common language or framework for talking about projects. The game helps create that -it is a level playing field for everyone. 8. Do you know of other projects with similar aims, scope and format? Have you had any feedback from or collaborated with them in any way? There are a lot of other facilitators using workshop methods, but I don't have any close collaborators on games besides Drew Mackie. It is easier to share experience with people involved in the use of social media because they blog about it. 9. Games are frequently present in schools and other educational environments for children, but very rarely used to interact with adults. Do you think administrations and local governments could make use of the game structure to address/resolve certain social issues? Yes -if you mean games and simulations. 10. What other alternative communication mediums have you used or considered using apart from game-based ones? Other interactive event formats like open space. Many online spaces. 11. Atomisation on a large scale (such as in the Debian 'apt' packaging system) has allowed large software projects to employ an amazing degree of decentralised, collaborative and incremental development. But what other kinds of knowledge can be atomised,and how? How can we atomise pedagogy? The nature of software development is that you can create small chunks for development within an agreed framework. We have found that the game format can be used in the same way -people can create their own sets of cards within the framework that we have developed. 12. What kind of networking methods can a collective project use to dynamize its activities and processes? (1) This interview was carried out at the beginning of 2008, after the first public actions with the Bank of Common Knowledge (BCK), when Platoniq researched into new points of view to expand their collaborators network and to enhance and develop BCK's structure, contents, participation strategies and economic sustainability. To achieve this, we got in touch with several collectives, projects managers and consultants whose work and activities were similar to Platoniq's and BCK's philosophy. We conducted surveys and carried out interviews and consultancies with experts who came from different contexts and had various needs. Thus, we obtained a wide spectrum of answers and oppinions.